Why people don’t grow rich by investing in stocks? Alot has been said and written about generating wealth by investing for the long term in Equity markets. The mutual fund industry in India now boasts of monthly collections through Systematic Investment Plans (SIPs) of over Rs 6,000 crore – a bulk of these investments are by retail investors who plan to get rich by investing in the Equity markets for years. Will these investors really achieve their Goal of creating wealth for themselves in the long run? It's their own behaviour, tested several times by the market that may be the biggest impediment in their dream of growing rich as a large number of investors cash out early. There are three main reasons why investors could fail to realise their dream of building a corpus with crores of rupees in it..
Firstly, they fail to realise the fact that the initial amount should be a substantially large amount. 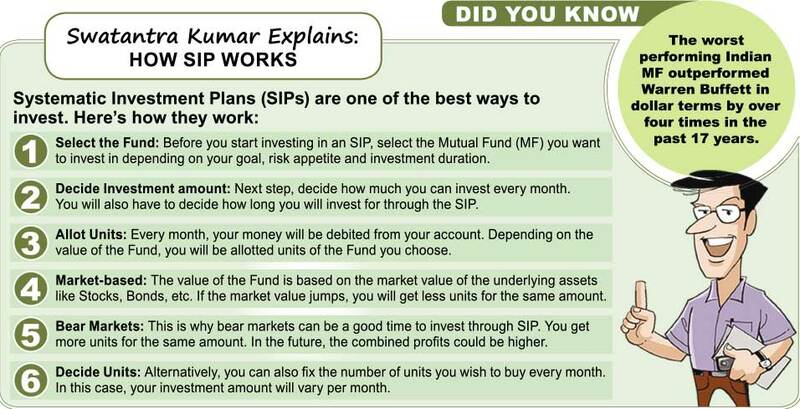 For example, if one starts with a monthly systematic investment plan (SIP) of Rs 1,000 for 25 years, and the fund gives an annual average return of 15%, the total corpus at the end of the term would be nearly Rs 33 lakh. On the other hand, if one starts investing Rs 10,000 in that same fund with the same expected rate of return through a monthly SIP, the corpus at the end of the 25-year investing journey would be almost Rs 3.3 crore. It’s high time investors realised that the initial amount they start their investment journey with should be substantially large and not just a token amount. Second factor that comes as a hurdle for investors to build wealth in the long term is their flawed definition of long term. In one’s life’s investing journey, 4, 5, 6- year periods should be considered as short term. They should start thinking about 20, 25, 30- year periods as the long term. Investors need to give time to their investments to grow into a large corpus. For example, if a saver keeps Rs 10 lakh in an investment product that would double his money in five years, he would get Rs 20 lakh at maturity. Now if the same investor decides to keep his money in the same instruments for 30 years, at the end of the period his total corpus would be Rs 6.40 crore. Lastly, investors need to learn to hold their emotions and not react abruptly when the market goes down or it does not behave the way as expected at the start of the investing journey. For every investor, patience is an important virtue. There could be instances where the drawdowns, that is the investments of the past few years may go down completely. This may happen because market movements are non-linear in nature and hence the returns of any two periods are always expected to be dissimilar in nature. Generally investors can’t digest volatility well. So in situations of market slide or volatility how investors react and eventually what they do with their investments decide who could be a winner in the long run. Investors should develop patience when it comes to investing. And at the beginning of their investing journey they should know that they would probably be tested several times by the market.